Having a new foundation to build on after a fishing season is a great feeling. For the first time in a long time, fishing for muskies changed for me last season because I discovered something that has given me an edge. Author Luke Ronnestrand and his client, Roy Ridback, share a smile over Roy’s big musky, which was spotted with side-imaging. I guide on Minnesota’s Lake Vermilion, a beautiful 42,000-acre shield water lake with a low-density musky population, metro-like fishing pressure, a thousand good spots and notoriously-tight feeding windows. Such factors make it challenging to stay “on” fish every day. Extra time, effort and gas are needed to gather the clues necessary to put muskies in the boat. But now, thanks to advancements in side-viewing sonar technology, I don’t need to have a follow, see a “sitter” basking in the sun-baked shallows, or perfectly mark a musky on 2-dimensional sonar to know muskies are using the structure I’m fishing. I can now see muskies clearly by using side-imaging and use it to break down patterns more quickly and effectively. Side-imaging has been around for about a decade and all of the major marine electronic companies offer units with side-viewing capabilities. Any of these units will show hard to soft bottom transitions, weedlines, rocks and fish. However, Humminbird has taken the lead by utilizing 1.2 megahertz frequency, refined software and dedicated crystals in the transducer for Mega Side and Mega Down Imaging. The clarity and definition of the new Mega units can differentiate between muskies, logs or even sturgeon. It’s also worth noting that Mega Imaging units show the whole water column from the bottom up to just under the surface, which make them very functional in shallow and deep water. The shallow water capability and image clarity of these units are two important factors for musky fishermen, as muskies and musky forage suspend high in the water column and many muskies get caught in shallow water. 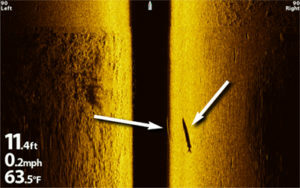 A screenshot of Roy Ridback’s musky as seen by 2D view (left arrow) and side-imaging (right arrow). The most important thing about having good equipment is knowing how to use it and, in this case, knowing what you are seeing. The best way I can explain how to read side-imaging is comparing it to a flashlight beam. The light hitting an object is going to be bright and a shadow will be cast behind whatever object the light is hitting. The same is true when viewing side-imaging. When the sonar beam contacts a solid object raised off the bottom we will see a bright mark, and a shadow will appear behind that object or fish. When looking at fish and objects raised off the bottom, you will be able to see a shadow that often reveals more detail about the fish or object than the actual bright mark of the object. As one might expect (keeping the unit’s settings equal), the larger the shadow, the larger the object or fish. On the screen, hard objects will provide a bright return and softer objects will be darker. This can help tell you a lot about bottom composition and transition areas in a lake. A rock or sand bottom will be brighter on the screen, whereas a soft, silt or mud bottom will be darker. Sometimes these bottom transition areas can be key to understanding patterns of fish locations. As you look at a side-imaging screen, you’ll notice the view is composed of three parts — the left side of the boat, the right side of the boat and the black, center section that shows the water under the boat as well (down imaging). At the top center of the screen you will see a boat icon that will show you how the screen is divided into the left and right sides, with the newest information scrolling from the top down, instead of the right to left on traditional 2D sonar. Looking at the shallow water side of the screen, you will see an image where the sonar will stretch out to your adjustable scanning range. If you are close enough to shore, you will be able to see the black edge of the shoreline, weed edges and objects like dock posts and boat lifts. This can be helpful for spotting fish lying under some of these areas, not visible with the naked eye or 2D sonar. Enlarged screenshot of Roy Ridback’s musky. When looking toward deeper water you will see an image out to your set range, unless there is a break that drops off sharply. In this case, the transducer’s beam will lose contact with bottom because the sonar beam shoots over the edge of the drop off and casts a shadow to the end of your set scanning range. Despite this, you will still be able to see objects raised off the bottom on this side of the boat, such as standing timber and suspended fish, because they are higher up in the water column and still in the beam pattern. To see these things better, I simply adjust my boat position by driving back on the other side of the drop-off so that the area is covered by the sonar beam. The center section of the screen, in black, is sometimes tricky for new users to understand, but once you get the concept, it’s easy to pick out the important details. The black portion is the water column beneath the boat and is the same data on your down imaging screen, laid out horizontally to give you an entire picture under and to each side of the boat. When viewing the water under the boat on side-imaging, you’ll notice that as the boat goes into deeper water, this section of the screen will grow wider due to the increased coverage of the down imaging beam. The reverse is true when moving into shallower water — the down imaging section will narrow. You will even be able to identify if fish or structure are slightly to the right or left side under the boat by seeing an object on down imaging and then looking to the water column on side-imaging to determine on which side of the center section it is predominately showing. There is a “contour mode” setting that will replace the black down imaging portion with additional side-imaging viewing, but I prefer to use the standard side-imaging view so I can see things near and under the boat. Doing this allows me to more easily see lures, follows and muskies looming around and under the boat — all of which you can see if you are fishing in your transducer’s beam. As a guide, I fish from the stern of the boat. On my console I have two units, one for GPS and the other, a Helix 12 Mega SI GPS G2N solely for side-imaging, which provides constant information. Side- and down-imaging require movement and work well at speeds up to 5 to 6 mph, with the boat heading in a straight line so the images are not stretched or compressed. As your boat turns, the image will distort but will still be useful. As your boat speed adjusts, so will the images. The slower your boat is moving the larger and more stretched out things may appear on the screen. I typically run my chart speed number somewhere in the middle so that I can quickly cover water and limit adjustments as I go. Simply adjusting your chart speed number to match your boat speed in miles per hour will clean things up when you are looking for those ultra-high quality images. In my opinion, side-imaging is even more valuable as a view around you while casting. Even at casting speeds of 0.3 mph to 1 mph, you have an unbelievable view of what’s happening around you. Whether you’re casting or trolling, I suggest setting your range about four to five times the depth you’re fishing, which will put the most useful information on your screen. I generally run a maximum range of around 100 feet while casting; while trolling I adjust the cover to see outside my trolling spread. If I am scouting, I will set the unit to scan only to the right or left to view the structure I am searching. Doing this makes the image of my targeted areas the largest possible on the screen, which helps pick out small details and fish tight to bottom or in cover. While casting, I set my unit to scan to both right and left side. It’s amazing how many fish will be scanned on the side of the boat opposite to where you are casting! The fish looming around the structure are catchable and are often missed by anglers who fish quickly by them or are simply unaware of their presence. The only way these fish were obtainable in the past were multiple passes around the spots at different depth ranges or casting angles. You can now see the exact areas muskies are using, making your fishing much more efficient. It has been fascinating following groups of fish on a daily basis trying to pattern their movements on and off structure. If you are just getting started using side-imaging, I suggest looking at structure with which you are familiar, which will help you understand how structure looks on the screen. Factory settings will provide a great image as you start. Once you understand side-imaging better, you can tweak the settings to your preference and water conditions. I typically increase the sensitivity and contrast slightly. Generally, I like the contrast slightly higher than the sensitivity, but each angler should pick what looks best to them. Note that the higher your sensitivity setting, the brighter the return will be off of harder objects. If you are getting a washed-out look, turn the sensitivity down. To a certain extent, increasing the contrast setting will enhance the definition of the shadows and edges of fish and structure. This helps make fish more visible, even in heavy vegetation. Side-imaging has always been amazing for scouting structure and finding fish. You could find muskies, but there was always some doubt about what you were looking at. Unless the musky was high in the water column and cast a perfect shadow, it could be easily missed. Logs, rock shadows and thick vegetation could also be confused and mistaken as a musky in the past. But muskies appear as muskies with Mega imaging. The marks are bright and the shadows are unmistakable. I no longer have to see a musky with my own eyes to know it’s there. I can find muskies outside of feeding windows — even those that don’t follow — and come back during a feeding window and catch them. If you are not having success during a feeding window but you’re on fish, you will know when it’s time to change things up because you can pattern musky movements on and off of structure as well as when and why they use areas. You can see where the fish are and adjust where your casts should be landing. One effective way to target the fish you mark on side-imaging is to scroll the cursor over the fish you see on the screen and mark a waypoint. Now you have an exact spot on your map of where the fish is located and where to cast. Under tough conditions, making multiple casts to the same fish can be effective. 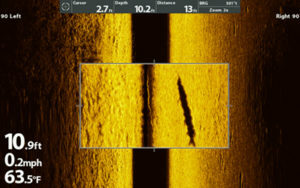 Utilizing the newest in side-imaging sonar put several muskies in the boat my clients and I would never have caught in the past. Tough days ended well, several guests caught personal bests, and even a tournament was won all because of muskies that were seen using Mega. These fish did not move off their spots, so when we returned during feeding windows or boat depth adjustments were made, the fish hit the net. Many “after hours” conversations with my friends and guiding peers are now centered around what we are seeing with our electronics. It changed musky fishing for me and I can’t wait to see what directions it will take us as we learn more. Contributing Writer Luke Ronnestrand is a Minnesota musky guide. For more information, call (952) 807-2947. This and other great articles can be found in the June/July 2018 issue of Musky Hunter. To subscribe, click here.